In addition to private sessions, many choose periodic Personal Intensives. During these three-day intensives one receives at least ten private sessions. Usually intended to address a particular area of identified emotional need, Personal SHEN Intensives are designed to facilitate an even deeper and more accelerated experience of inner growth, emotional unfolding and personal re-empowerment. These workshops are highly experiential, and are designed to assist you in your own emotional unfolding and personal reintegration. Participation in these workshops is also the first step for those wishing to be trained in SHEN Therapy. During these transformative workshops, you receive at least 20 SHEN sessions under the guidance of a Certified SHEN Instructor/Facilitator, while you also learn SHEN techniques to help others. In these workshops, you begin by learning basic SHEN theory, principles and techniques. You continue to expand your personal growth as you receive and give SHEN sessions throughout the workshop. You will find that SHEN theory deepens and clarifies Eastern concepts of chakras and Chinese Wei Qi, as well as complimenting and enhancing psychotherapeutic diagnostic and treatment skills. You will also learn how to use the healing potential you carry in your hands. You do not need special abilities of any sort nor subscribe to any specific spiritual or metaphysical belief system to be successful with SHEN as either a client or practitioner. A willingness to experience your own emotional growth and a desire to expand your knowledge and awareness are all that is necessary. Many professionals take this workshop to learn SHEN techniques and integrate them into their primary practice. Although SHEN has consistently been used to good effect as a stand-alone principal therapy itself, SHEN techniques can effectively be incorporated into other modalities to accelerate the healing process. help them get productively in touch with their emotions, and dramatically change Post Traumatic Stress Disorders into PAST traumatic stress. If you are a nurse, body worker or Hospice worker, non-invasive hands-on SHEN techniques will quickly relax and help both adults and children who are in fear and suffering connected with emotionally impacted physical conditions. 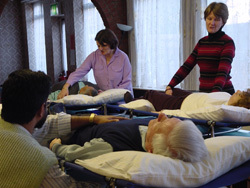 Continuing Education Units are available for Nurses and Massage Therapists for many SHEN workshops and trainings. Please contact The SHEN Therapy Institute for details. A live link is on our ‘Contacts & Articles’ page. Prior to taking the intensive Emotional Empowerment Workshop, it is required that all participants receive a MINIMUM of two sessions from a Certified SHEN Therapist or Supervised SHEN Intern. You will gain a much greater sense of this work if you receive three or more sessions prior to your workshop experience. Because the number of participants in each SHEN Emotional Empowerment Workshop is limited to allow for personal attention, your applications and your deposit or full payment should be received as soon as possible to guarantee your space. In response to the current economic conditions the U.S. fee for the full 7-Day Intensive Personal Empowerment Workshop has been lowered to $950. If full payment is received 2 weeks prior to the workshop, this fee is further reduced to $875. A non-refundable deposit of $100 will hold your space. In the divided Level “A” & “B” format each level is $475. If full payment is received 2 weeks prior to the workshop, the fee is reduced to $450. You are always welcome to repeat the SHEN Emotional Empowerment Workshop, subject to space availability. Returning attendees, please contact the Registrar for a reduced ‘repeaters’ fee. For a full current schedule of Emotional Empowerment Workshops in the USA and abroad, visit the website of The SHEN Therapy Institute. Once again, a live link is on our ‘Contacts & Articles’ page. A two year, 680+ hour Supervised Internship Program leads to Certification as a SHEN Therapist. The Internship Program includes intensive classroom training in the art of SHEN, clinical skills, mentor supervised practice, and deep personal growth through SHEN. Applicants must have taken a SHEN Emotional Empowerment Workshop twice and belong to the International SHEN Therapy Association. For complete information and details regarding the Supervised Internship Program, please contact the SHEN Therapy Institute using one of the links on the ‘Contacts & Articles’ page.